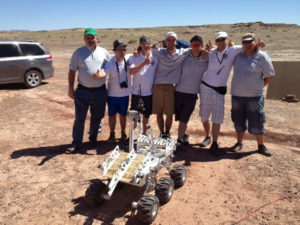 In December 2015, a record 63 teams from 12 countries set out to design and build the world’s top Mars rover as part of the University Rover Challenge. Now 30 teams have advanced past the Critical Design Review (CDR) stage of the URC contest and will participate in the field competition, being held June 2-4, 2016 at the Mars Society’s Mars Desert Research Station in southern Utah. The 2016 rendition of this contest, URC2016, introduces the first ever Semi-Final round of competition. On the first day, teams will race for the fastest time in a “short course” event that tests rover maneuverability and dexterity in the Mars-like terrain of the Utah desert, in addition to the student team’s scientific knowledge. The top 15 teams will advance to the Ares Finals and compete in a variety of tasks for the top overall spot. The remaining teams will then advance to the Phobos Finals for an equally exciting competition. During the CDR process, a panel of judges reviewed technical reports and video submissions from each of the teams. Judges were unanimously surprised at the extraordinary quality of teams and their rovers. The students, who have devoted countless hours to their projects throughout the academic year, put their passion on full display in their submissions. Due to the exceptional quality of rovers, the judges elected to expand the originally-planned 28 team field to 30. For regular updates about the 2016 University Rover Challenge in the months to come, please visit the URC Facebook page.